Once graduation festivities or football games conclude at the University of Findlay, find the perfect spot to recharge inside your hotel room at the Country Inn & Suites. Free Wi-Fi makes it easy for you to upload pictures from your day or catch up on work while you’re away from the office. Prepare a snack and have a cold beverage thanks to the in-room microwave and refrigerator, and then kick back on your comfortable bed for a night of watching TV. Need to get some work done? We make it easy with a spacious work desk. In the morning, you can wake to a fresh cup of coffee made using your in-room coffee maker. With pet-friendly rooms available, you can keep your furry best friend close while you travel. Ask about our dog-friendly rooms (fee applies). If you prefer an open floor plan, these rooms really fit the bill with combined sleeping and living areas. With separate sleeping and living areas, both families and traveling groups love the privacy of our One-bedroom Suites. 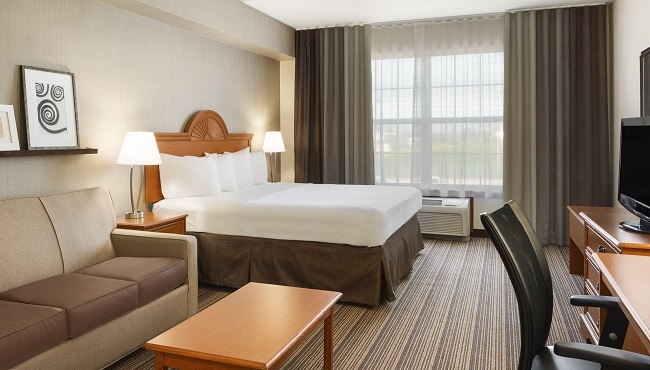 Book the largest room type at the hotel and take advantage of two private bedrooms in the Two-bedroom Suite. In this relaxing suite, guests enjoy all the amenities of a standard room with a spacious king bed and a whirlpool in the bathroom. An in-room whirlpool and king bed make the Whirlpool Suite the perfect option for couples in the Findlay area. From the wet bar to the large family room and dining area, the Extended-stay Suite really feels like a home away from home.